Now that you’ve got your dream pool, the fun and relaxation can begin! But amidst all the sunshine and swimming, don’t forget about keeping your beautiful pool well-maintained. Many prospective pool owners are put off by the idea of pool maintenance, but this should not be the case. Pool maintenance is now easier than ever, and proper care and preventative pool maintenance just a few times per week can help keep your pool pristine and problem free. Always check your pool chemistry. Testing the water is easy. All you have to do is buy a few testing kits from your local pool store. Fill it with a sample of your pool’s water. Add the provided solution to the testing kit and close the vials. After a few seconds, your sample water will change color and a comparison of the sample water to the colors shown on the testing kit should allow you to determine the current chemical levels. You should adjust the levels, as needed, to achieve an ideal balance. One mistake in pool maintenance is not checking you pool’s chemistry often enough. 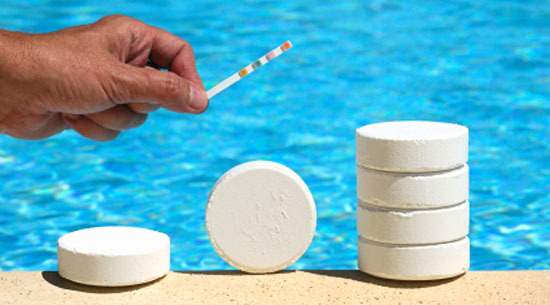 Check the pool’s chemistry one per week in the summer and once per week in the winter. By doing this you can make minor adjustment to your water chemistry instead of big ones that create a wild up and down graph of activity. Always make scrubbing a part of your routine pool maintenance. Pool maintenance is not just draining and changing the water, you also need to scrub the sides of the pool to prevent algae build-up. To make pool maintenance easier, you can get away with scrubbing once every other week. Just look for any growths and go at them with a scrub brush to keep your siding looking fresh and clean. A shock every fortnight won’t hurt. In pool maintenance, Shock treatment is not a replacement for proper, ongoing sanitization (such as chlorination), but is intended to help make sanitizers more effective. You should shock your pool according to the specifications on the product label. If using a chlorine shock treatment, you should not swim in the pool for several hours following the treatment.